The medical imaging workstation is situated in the field of information technology and has become an essential device in the clinical workflow of radiology departments. The images produced by digital x-ray computed radiography, direct digital radiography, computed tomography (CT) scanner, magnetic resonance imaging (MRI) scanner, ultrasound or any of the other digital imaging tools are stored in the medical imaging’s workstation’s PACS (or picture archiving and communication system), and then may be retrieved, viewed and worked on, according to need. The medical imaging workstation system was created in order to provide more economical and efficient storage of images, while giving quick access to rapid image retrieval, reports from multiple modalities and concurrent access from several different workstations at the same time. 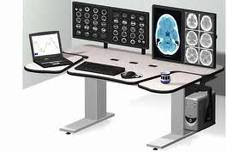 A PACS medical imaging workstation consists of four main mechanisms: imaging modalities such as CT and MRI, a protected system for the transmission of patient information, workstations for interpreting and reviewing images, and archives for the storage and retrieval of images and reports. Combined with already obtainable, as well as up-and-coming internet technology, PACS has the capability of distributing efficient, quick access to images, interpretations, and related data. PACS breaks down the physical and time barriers associated with traditional film-based image retrieval, distribution, and display, saving medical facilities both time and money. In the past, before the existence of medical imaging workstations, everything had to be printed out on paper and film imaging necessitated expensive, toxic chemicals. In addition, thousands of patient records had to be stores in a hard copy format, which had to be organized and weren’t easy to access. Since PACS and other types of medical imaging workstations have been developed, medical facility efficiency has greatly improved, the time wasted on routine tasks has decreased and most importantly, the focus on caring for the patient has become easier as many tasks are automated. This means that physicians and technicians consulting on a patient’s case can easily view the same images and communicate with each other. Most medical imaging workstations allow you to sort through thousands of digital images and work with the ones you want, while sharing them with others both onsite and offsite. Daily work can be backed-up and automatically and information from multiple workstations can be stored on a server both onsite and offsite. Many medical imaging workstations also allow you to add text to digital images. High-resolution display monitors are used to guarantee high-quality presentation of the images, and a color display monitor is also available for use with the radiology information system (RIS), so that color images can be best viewed. The RIS part of the system allows you to schedule patients, order tests, and write reports, upgrading your radiology department for the ultimate in efficiency.